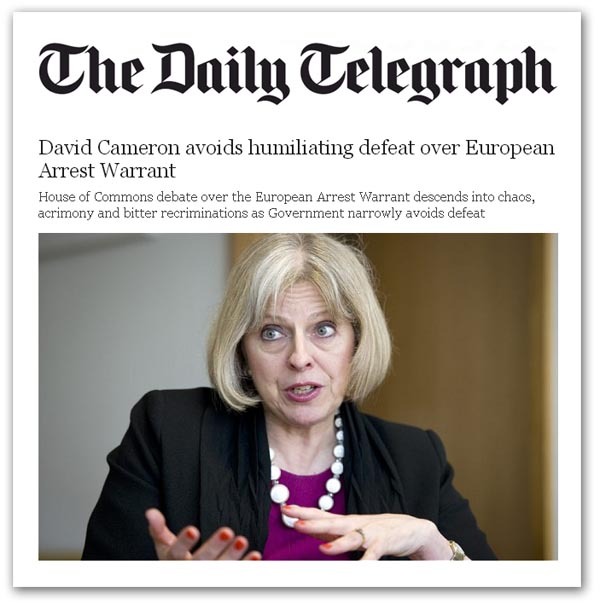 We are supposed to be getting excited, outraged or indulging in a whole range of emotions about the treatment of the European Arrest Warrant (EAW) vote yesterday in the Commons. In fact, the outrage in the Commons is synthetic. Both Labour and the Lib-Dems support the opt-in of the EAW, and only a minority of Conservative back-benchers want to make an issue of it. Thus, it was never going to be the case that the Commons was going to reject the opt-in, even if the opposition was going to do its best to make mischief over the issue, and cause as much embarrassment to the Government benches as it could. Nevertheless, the Government has handled the opt-ins tolerably well, making the best out of a poor position, selecting those measures which are absolutely necessary, or to our advantage, while ditching the rest. On the other hand, the rebels, led by Jacob Rees-Mogg, have never been able to offer a convincing argument on what to do by way of an alternative to the EAW, or explain what we would do in the absence of the opt-in. Rees Mogg speaks glibly of negotiating with the EU a bilateral treaty covering the removal of the EAW, allowing us to enjoy extradition arrangement without coming under the jurisdiction of the ECJ. However, to argue that these negotiations would happen is to make several assumptions. The first is that the EU would be prepared to partake – yet we have no means of requiring it to do so. Secondly, the process would necessarily be speedy. Assuming the first, the latter could well not follow. Negotiations could take two years or more – or longer. We have no idea, and no means of knowing. Anything would be a guess. The assumption is then that a bilateral treaty "could also apply different rules". But that is also an assumption. At a political level, the Commission (and member states) might be reluctant to reward the UK for non-communautaire behaviour. Rather, they might seek an agreement which would be no more advantageous than the EAW or, more likely, one that is noticeably inferior. It is then assumed that the UK could withdraw from a UK-EU bilateral treaty "if it began operating against the national interest". This could happen, subject to the Vienna Convention on the Law of Treaties (and any exit provisions) but where would that leave the UK, other than with no extradition provisions? We are also told that the UK could press for temporary EU legislation that applied the relevant EU legislation under the block opt-out (such as the European Arrest Warrant) to the UK for a set period of time while a bilateral treaty was negotiated. For this to happen, though, would require the assent of the Commission, the agreement of the member states and the approval of the European Parliament. These can be assumed – but they cannot be guaranteed. And then, while provisions may be temporary, that does not mean rapid implementation. It could take several years to bring into force. On this basis failing to opt in would expose the UK to the risk of there being a substantial but unknown period where there were no extradition arrangements, with the final agreement offering us conditions which a no better and potentially worse than we would be accepting under the EAW. The real answer, therefore, is to look at the bigger picture. Our ultimate objective is to leave the EU, whence we would be negotiating an overarching exit agreement, which would include extradition provisions. We could then move out of the treaty provisions, directly into the exit agreement, with no gap in coverage. For the time being, though, the possibility of a substantial gap in coverage presents unacceptable political and practical risks, leaving us in the unsatisfactory but necessary position of having to accept the EAW for what it is, until such time as we can move seamlessly into a better option. Thus, what happened yesterday was what was always going to happen. The excitement and drama is purely Westminster "bubble" fodder, of no significance or lasting interest.